hahahhahahha. this is GREAT. I so need a scanner. I have all my old diaries in my nightstand drawer! 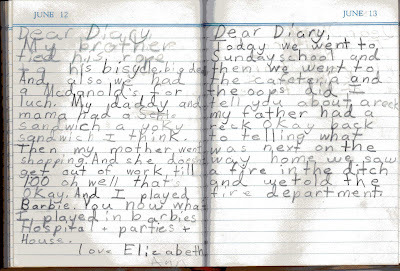 I never really kept a diary...my little sister always snooped so it wasn't worth it. I do love flipping through my journals from elementary school...ah to be 9 years old again! Yes you have always been a blogger! this is awesome!! very cool. I found an old diary of mine...the few entries that were in it, were very scattered thru out the year and all involved the topsy-turvy status of my friendship with Amber. That is so funny. 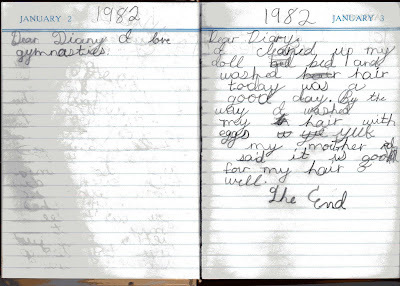 I tried to do a diary, and still to this day try and document in a calendar what happened each day. I usually make it through like March and then give up. My mom and grandma are the same way...I guess good intentions with no follow through is inherited. This is so freaking cool! It's like you started blogging then....you know it's funny considering I am such a blogger now, I was never able to keep a diary going.